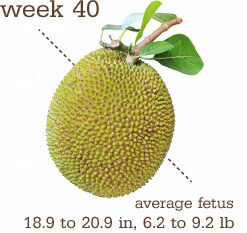 In month nine, the average fetus is about 6.2 to 9.2 pounds and measures about 18.9 to 20.9 inches (wow!). But you really won’t know exactly how big your baby is until his birth. Baby’s hair and nails continue to grow, and she’s keeping up that lung development too. Physically, OK. Most of the pain from the pubic symphysis seems to be gone, so that has been really nice! I am having an easier time walking and moving around in bed, and therefore sleeping better as well. Mentally though, this waiting is taxing. I hate to be gripey, since I’m only today at my due date, but given my history, I kind of feel like my due date was three weeks ago. And feeling like I can go at anytime has me just sort of in limbo for all this time. I can’t concentrate on anything and I have zero motivation to get involved in anything, and there is only so much TV you can watch. I have been able to get in a decent amount of reading, but even that is kind of hard to concentrate on. (Says the person who can normally read with no problem in a room with the TV on and conversations happening all around.) So…I wait. Still with the 29 lbs. I think my body must be refusing to cross into that 30 lb range. Totally self-explanatory at this point. Nothing else to do, that I can think of. If anyone has any suggestions, let me know. Maybe I forgot something? But no guarantees I’ll do it even if you come up with something. See above, regarding zero motivation. I love that picture of you! And we eat jackfruit pretty often, if you cook it with bbq sauce it shreds and tasteless like pulled pork. weird!